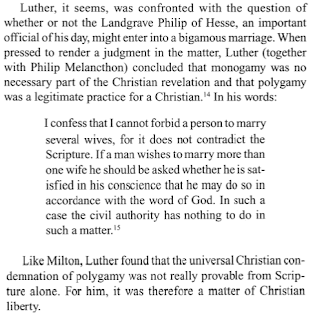 Luther: "I confess that I cannot forbid a person to marry several wives, for it does not contradict the Scripture"
In his old magnum opus (updated with a disclaimer that I probably provoked), Another of Rome's defenders states, "Luther believed that polygamy was sanctioned in Scripture: I cannot forbid a person to marry several wives, for it does not contradict the Scripture. (De Wette, vol. 2, 459)." For this cyber-apologist, Luther saying "contradict" means "sanctioned." Luther was an out-and-out believer in polygamy. To say that he did not "counsel" polygamy, or that he advised that it should be kept secret as a sort of matter of "conscience," is utterly beside the facts. When Bruck, the Chancellor of the Duke of Saxe-Weimer, heard that Carlstadt in 1524 advocated polygamy he consulted Luther on the new and pernicious teaching. The Reformer, not in the least abashed, openly and distinctly stated: "I confess that I cannot forbid a person to marry several wives, for it does not contradict the Scripture. If a man wishes to marry more than one wife he should be asked whether he is satisfied in his conscience that he may do so in accordance with the word of God. In such a case the civil authority has nothing to do in the matter." (De Wette II, 459.) 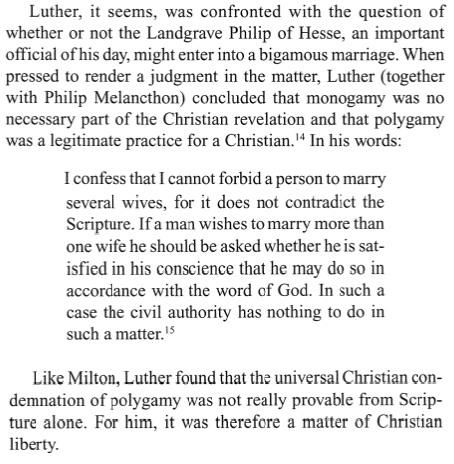 Many other clear statements wherein Luther sanctions polygamy might be reproduced here, but the one given above will suffice for the present. To my knowledge, there is no complete English translation of this short letter, but extended sections are available. The prince ought to ask the bigamist, 'Have you obeyed your conscience directed by God's word?' If he replies: 'It is by Carlstadt,' or some other, the prince has nothing more to object; for he has no right to disquiet or hush the inward voice of that man, or decide in a matter entirely within the jurisdiction of him who, according to Zacharias, is commissioned to explain the divine law. For my part, I confess that I do not see how I can prevent polygamy; there is not in the sacred texts the least word against those who take several wives at one time; but there are many things permissible that ought not becomingly to be done: of these is bigamy [source]. When in 1524 Carlstadt, then at Orlamünde, advocated polygamy, Brück, the Chancellor of the Duke of Saxe-Weimar, consulted Luther on this point. The reply was that such a thing could not be considered as forbidden in the new Law. Let the prince answer: "The husband must, by the word of God, be sure and certain in his own conscience, that it is lawful to him. Let him enquire of those who can make him sure through the word of God; whether this be done by Carlstadt or by anyone else this matters not to the prince. For if the man is uncertain, he cannot become certain through the consent of the prince, who in a matter of this sort cannot decide anything. It is the duty of the priests, to answer with the word of God . . .I confess that if a man wishes to marry several wives, I cannot forbid it, nor is it in opposition to the Holy Scriptures; but I would not that such an example should be introduced amongst Christians, who ought to omit even lawful things for the sake of avoiding scandal and leading a pure life, as S. Paul demands. For it is very unbecoming to Christians, eagerly to pursue, for their own comfort, their liberty to its last consequences and yet to neglect the common and necessary duties of charity. Therefore I have not in my preaching opened this window, and I hardly believe, a Christian can be so far abandoned by God, that a man who by God's action is hindered (from the use of conjugal rights) should be unable to contain himself. But let things go where they go. Perhaps they will even introduce circumcision at Orlamünde and will become Jews entirely." "...but I should not like to see this example introduced amongst Christians. ... It does not beseem Christians to seize greedily and for their own advantage on every thing to which their freedom gives them a right. . . . No Christian surely is so God-forsaken as not to be able to practise continence when his partner, owing to the Divine dispensation, proves unfit for matrimony." When O'Hare states, "Luther was an out-and-out believer in polygamy" and Shea concludes, "Luther (together with Philip Melanchthon) concluded that monogamy was no necessary part of the Christian revelation and that polygamy was a legitimate practice for a Christian" these two defenders of Rome either grossly ignored the context, or perhaps never saw the context. ...severe necessity, for instance, if the wife develops leprosy or becomes otherwise unfit to live with her husband… But this permission is always to be restricted to such cases as severe necessity. The idea of legalizing general polygamy was far from the reformers mind. Monogamy was always to him the regular form of matrimony… (Luther And The Reformation in Light of Modern Research, 213-214). His rash and confused mind led him entirely to confound the national with the religious element of the Old Testament. Luther expected that before long circumcision would be introduced at Orlamunde [where Carlstadt was preaching], and thought it necessary seriously to warn the elector against attempts of this nature [source]. After Carlstadt had become increasingly radical, he left Wittenberg's faculty. Carlstadt went to Orlamunde in the Thuringian countryside, right around the time this letter from Luther was written (Jan. 27, 1524). The interesting thing about the quote in question is that by this time, Luther had a grave distrust of Carlstadt, yet in this letter Luther states, "it is the priests business to expound the Word of God." The way I read it, Luther is saying that secular authorities are not to interpret the Bible on this point. Rather, it is the job of spiritual authorities. For better or for worse, Carlstadt was the spiritual authority in Orlamunde. Early in 1524 the Wittenberg faculty took steps in attempting to recall Carlstadt from Orlamunde in order to try to curb his radical nature. They still held out some sort of hope that he wasn't too far gone in his radical leanings. The bigger point for Luther was not bigamy as such, but that secular authorities didn't have jurisdiction to interpret the Bible. Carlstadt is reported to have stated something like, "As neither you nor I have found a text in the sacred book against bigamy, let us be bigamists and trigamists .... let us take as many wives as we can maintain. Increase and multiply. Do you understand? Accomplish the order of heaven." Sometimes this quote is put forth as addressed to Luther, but I haven't been able to document the date or the recipient, or if it was written in or around January 1524, or if it has anything to do with the Luther quote in question. As regards the other matter, my faithful warning and advice is that no man, Christians in particular, should have more than one wife, not only for the reason that offense would be given, and Christians must not needlessly give, but most diligently avoid giving, offense, but also for the reason that we have no word of God regarding this matter on which we might base a belief that such action would be well-pleasing to God and to Christians. Let heathen and Turks do what they please. Some of the ancient fathers had many wives, but they were urged to this by necessity, as Abraham and Jacob, and later many kings, who according to the law of Moses obtained the wives of their friends, on the death of the latter, as an inheritance. The example of the fathers is not a sufficient argument to convince a Christian: he must have, in addition, a divine word that makes him sure, just as they had a word of that kind from God. For where there was no need or cause, the ancient fathers did not have more than one wife, as Isaac, Joseph, Moses, and many others. For this reason I cannot advise for, but must advise against, your intention, particularly since you are a Christian, unless there were an extreme necessity, as, for instance, if the wife were leprous or the husband were deprived of her for some other reason. On what grounds to forbid other people such marriages I know not" (21a, 900 f.) This letter effected that the Landgrave did not carry out his intention, but failing, nevertheless, to lead a chaste life, he did not commune, except once in extreme illness, because of his accusing conscience." ( Luther Examined and Reexamined: A Review of Catholic Criticism and a Plea for Reevaluation (St Louis: Concordia Publishing House, 1917, 103-104). Regarding “fundamental Christian doctrines,” however, Evangelicals unconsciously function exactly like Catholics and read their Bibles in light of Sacred Tradition, which has percolated down to them from pre-Reformation Catholic Tradition. Thus, Evangelicals do not declare monogamy to be optional, even though Scripture alone is far more ambiguous about monogamy vs. polygamy than it is about Purgatory or the Real Presence—a fact recognized by Martin Luther and his colleague Philip Melancthon. This apologist however, proves monogamy by the Scriptures, "On the contrary, Jesus Christ (Matt 19:6-9) and St. Paul (Rom 7:3; I Cor 7:2; Eph 5:32-33) presupposed monogamy as normative for the Christian. " Shea's understanding would appear to coincide with Dau's point (which I have not checked) that "not until 1060 was there any authoritative mandate of the Church against polygamy." That is, according to a Roman paradigm, up until 1060, polygamy was open to speculation. This would explain Dau's statement that "St. Augustine, declared that bigamy might be permitted if a wife was sterile." So, perhaps Roman Catholics are left with monogamy because Rome finally said so in 1060. It would be interesting to find this declaration- if it exists. I was recently asked what amounts to: "When did Church Tradition go wrong?" There are so many places in which the tradition to which RCC subscribes went wrong that it's impossible to place some collective When. There are also places where they still have it right - Trinity, Christology (kinda), Bible as God's Word (or, some RCs), etc. So we would have to ask which doctrine in particular. And even then it's nearly impossible. 1) How many churches in the NT already had it wrong? Even after apostolic teaching and even correction? Corinth, Rome, Galatia, Ephesus, Colossæ, Thessalonica, Crete, the church to which 1 John is addressed, Pergamum, Thyatira, Sardis, Laodicæa. And these are in the lifetime of the apostles! And of course, the OT provides a paradigm for history as well - how much time did OT Israel spend in fairly-close obedience to God's Word? Very little. Yet God always preserved a remnant, which had the upper hand in numbers and influence sometimes but infrequently. 2) RCC picks and chooses which parts of CF writings it will follow and which it won't. The final authority is the Church. ECF writer X will say this or that and RCC will say "well, he's just speaking as a private theologian here", but if he says something else in the same document, alluvasudden he's a reliable witness to the universal and ancient church's constant tradition. Why should anyone put any credence in an approach such as that? 3) This is a subset of #2. 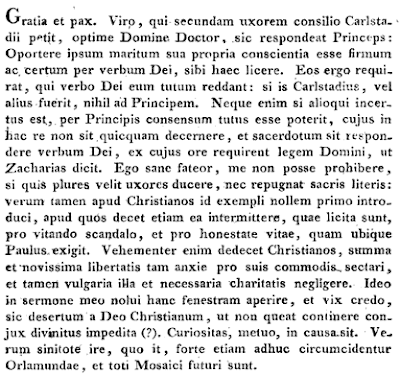 Theodoret of Cyrrhus (393-466) Hebrews 9:27-28: "As it is appointed for each human being to die once, and the one who accepts death’s decree no longer sins but awaits the examination of what was done in life, so Christ the Lord, after being offered once for us and taking up our sins, will come to us again, with sin no longer in force, that is, with sin no longer occupying a place as far as human beings are concerned. He said himself, remember, when he still had a mortal body, “He committed no sin, nor was guile found in his mouth.” It should be noted, of course, that he bore the sins of many, not of all: not all came to faith, so he removed the sins of the believers only." [Robert Charles Hill, Theodoret of Cyrus: Commentary on the Letters of St. Paul, Vol. 2 (Brookline: Holy Cross Orthodox Press, 2001), p. 175. B: Call these teachings not actually part of Divine Tradition. The problem w/ resolution A is that the cognitive dissonance would be pretty much unbearable. The upshot is that I don't know if I'd expect a lot of people to turn away from RCC in real life. The thing about resolution B is that they have indeed already done just that. Somehow these two godly, forcible, powerful writers, from whom RCC ostensibly derives much of its tradition and doctrine, also produced impious, ungodly, and flat wrong teachings. Now, how would the RC know this? Apparently from judging these non-"Apostolic Traditions" by... yup, you guessed it! What The Church® Says. In the end, it's a vicious circle of question-begging. I claim the modern RCC is not totally faithful w/ Ch Fathers and then cite them when challenged. Then they say, "Hey, those aren't part of Apostolic Tradition!" I say, "Thanks for proving my point." Note how this is the exact same thing they do with Scripture. Sola Ecclesia. I also pause to note how pernicious this is. The Lord Jesus set an authoritative example for how one is to judge tradition - by Scripture. The RC refuses to do that and instead appeals to his own doctrinal construct which is already in place to then look BACK on tradition AND Scripture and pick and choose what he'll believe and what he won't believe. Thus the RC holds to the Scriptural teaching of the Deity of Christ and rejects the Scriptural teaching of salvation by grace alone thru faith alone. He accepts the Trinity and rejects sola scriptura. He accepts the fact that we should pray to God as commanded in the Scripture and rejects the fact that prayer to dead people and angels is strictly prohibited in the Scripture. It becomes easy to see how this not only dishonors God in ideal (that is, that we should not judge men's teachings by God's) but also later in practice (bowing down to images, praying to dead people, trying to earn merit towards one's salvation). "…We’re impacting people’s lives—and helping people grow closer to God—one day at a time. Here at Catholic Answers, that’s what we’re all about. We’re here to defend, explain, and promote the Catholic faith. We’re the largest organization of our kind in the world. And, frankly, the most effective…." "…In various ways, we’ve reached and influenced millions upon millions of people. …That’s why I’d like to give you my vision for the future of Catholic Answers and show you how God is using our apostolate to help rebuild the Catholic Church and restore some sanity to our culture…. …And believe me, the demand for our work is growing tremendously every day. More and more people are turning to Catholic Answers for clear, powerful information about the faith—to the point where we hardly can keep up with the calls, letters, e-mails, and other requests we get!..." …"As a result, This Rock has led more people to the Catholic faith—or back to it—than any other journal of its kind being published today…Yet, the readership of This Rock still stands at around 36,000—a far cry from what it needs to be in order to maximize the true potential of this publication…"
"…When it comes to apologetics, the thing people need most is someone they can talk to for fast, reliable answers to their most burning questions. For years, we’ve had staff members take phone calls from anyone who calls in with a question he wants to ask us. More good is done through this one effort than you can ever imagine. That’s because callers get a chance to connect with one of our expert staff apologists—a real, live person who understands their questions and knows the answers. Our apologists are well-versed, well-trained Catholic experts with years of experience under their belts. They know the answers to virtually any question you could ask them. And they know how to communicate those answers in ways that people accept and embrace—even people who formerly disagreed with the Catholic position…"
"…Catholic Answers speakers are some of the best in the land. Every month, they go out to parishes across the country to give our special brand of parish seminars—where we present the basic elements of the Catholic faith to all who want to attend. Our parish seminars have borne a great deal of good fruit in the last several years. With Tim Staples, Jimmy Akin, Jim Burnham, Ray Guarendi, Marcellino D’Ambrosio, and Mark Shea—we’re doing even more good work for the glory of God…"
Here we have another of example where Catholic reality doesn’t appear to match the arguments of Catholic epologists. Protestants are told they cannot trust their own interpretation when reading the bible but are in need of an infallible interpreter, especially to provide clarity around modern-day moral issues (contraception, stem cell research, etc.). But in reality we see thousands to millions of Catholics turning to a layperson organization for fallible answers and interpretations. Shouldn’t Catholics be asking questions of their priests and bishops rather than Catholic Answers? We are also told by Catholic epologists that Protestants have no authority structure, but who is keeping an eye on Catholic Answers? Is a member of the magisterium monitoring the literature or radio shows put out by Catholic Answers? How has Catholic Answers not set themselves up as a private interpreter of Catholic teaching? Finally, I would say that the popularity of Catholic Answers, especially the question and answer programs, suggests that the existence of an infallible teaching magisterium hasn’t provided much clarity to lay Catholics. While there are many faithful Catholics, there doesn’t appear to be much unity in conclusive knowledge of what the church teaches. But this isn’t surprising considering the vast wealth of documents a Catholic would have to consult to get a full answer – catechisms, papal encyclicals, council decrees, canon law, writings of early church fathers, etc. Short of a Vatican hotline, I’m guessing lay Catholics will have to continue to seek out Catholic Answers to at least get a fallible answer to their “burning questions”. Here was an interesting exchange by Jimmy Akin and Scott Windsor on how to deal with Calvinists that swim the Tiber. P = Perseverance of the elect (until the end of life). There are other ways to construct a Thomist version of TULIP, of course, but the fact there is even one way demonstrates that a Calvinist would not have to repudiate his understanding of predestination and grace to become Catholic. He simply would have to do greater justice to the teaching of Scripture and would have to refine his understanding of perseverance. That is well and good, but the criticism of using their terminology still exists (as with my initial article which did much the same as Akin's here does). If one is to convert to the True Church, then why hang on to errors of the past at all? When one converts, they need to RENOUNCE their past - and EMBRACE that which they now KNOW to be the Truth. Let's not "tiptoe through TULIP," let's just crush the TULIP so they can move on and know the Truth. Hmm... let's see...which one is the correct approach? Catholic apologist Jimmy Akin has posted on a rumor that Pope Benedict has signed a document "removing" the excommunication that applies to four Lefebvrist bishops in the SSPX movement. Now our disobedience is motivated by the need to keep the Catholic Faith. The orders being given us clearly express that they are being given us in order to oblige us to submit without reserve to the Second Vatican Council, to the post-conciliar reforms, and to the prescriptions of the Holy See, that is to say, to the orientations and acts which are undermining our Faith and destroying the Church. It is impossible for us to do this. To collaborate in the destruction of the Church is to betray the Church and to betray Our Lord Jesus Christ. Hi Carrie, I think that you have a grave misapprehension of the authority of the Magisterium. Actually, I'm simply tired of Roman Catholic double standards, and I'm sure my co-bloggers are as well. Roman Catholics chastise Protestants continually for using "private interpretation" and having disagreements. They've got all their apologetics books, like Madrid's "Where's That in the Bible?" 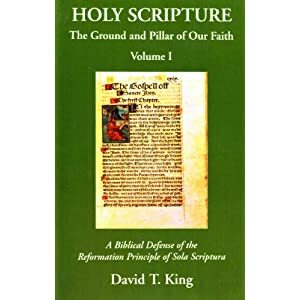 in which he states, "I as a Catholic look not just to Scripture alone...but also to the Church and its living Tradition" and also in coversation with a Protestant, he tells them they, "can't just assume we have the correct understanding of Scripture" (pp. 10-11). No, Madrid's got the right interpretation! So, OK, show the beef. Show us a unified Roman Catholicism. Show us your certainty. Show us the infallible interpretation of Scripture. Show us unified historical “Tradition.” Show us how your theologians and apologists have a collective agreement down the line. But Wait! There's small print (Mr. Hoffer, your job requires you to scrutinize the small print). The small print tells us Roman Catholics have a wide range of freedom to interpret things however they want to, as long as it does not contradict official teaching. The small print tell us very little of the Bible has an infallible interpretation, thus giving Roman Catholics the freedom of interpretation on 99.9% of the Bible. The small print tell us even with infallibly defined dogma, those dogmas are open to interpretation. Even verses allegedly infallibly defined can still be open to interpretation. This just stinks. I will continue to point out this double standard as long as there is breath in my body. You guys have got to admit your double standard. We’re going to continue to embarrass you. Both DA & Sungenis should be going to their local bishop, and that bishop should be going to the authority above him and so on, until it gets back to your infallible Magisterium. Let your infallible authority tell us which of the Rock ‘Em Sock “Em Robots is right. If you guys can’t do this, then, I suggest you Mr. Hoffer, start a movement within Catholic apologetics called “Let’s Cease The Double Standards Against Protestants” (LCTDSAP), in fact, we’ll help you over here. You appear to be reasonable person. All we need is a few reasonable Catholic apologists to face the music and admit the Catholic apologetic community has been out of tune with their argumentation for 500 years. You could be….a Catholic apologetics Reformer! You could be the guy who finally says, "enough is enough!" "We have to try a different approach here... we can't keep using a standard that we ourselves don't keep." And then, simply argue honestly and point out that Roman Catholics want everyone to accept their authority paradigm as a beginning presupposition. That is, you guys want us to make a leap of faith and accept your unproven beginning faith claim. Sure, you can argue your church is old, and that you have all sorts of cool rituals, and the like. But these arguments that somehow Rome is unified have to stop. They're making you guys look very silly. OK, I know I poke fun at Rome's apologists, but they are difficult to take seriously when they post things like this. While surfing around I came across a mention of a book called The Secret of Mary by St. Louis De Montfort. The full text is actually available online and it is a disturbing read. I am included a few paragraphs below, not consecutive (pay attention to the paragraph numbers for breaks). 23. The difficulty, then, is how to arrive at the true knowledge of the most holy Virgin and so find grace in abundance through her. God, as the absolute Master, can give directly what he ordinarily dispenses only through Mary, and it would be rash to deny that he sometimes does so. However, St Thomas assures us that, following the order established by his divine Wisdom, God ordinarily imparts his graces to men through Mary. Therefore, if we wish to go to him, seeking union with him, we must use the same means which he used in coming down from heaven to assume our human nature and to impart his graces to us. That means was a complete dependence on Mary his Mother, which is true devotion to her. 28. Chosen soul, this devotion consists in surrendering oneself in the manner of a slave to Mary, and to Jesus through her, and then performing all our actions with Mary, in Mary, through Mary, and for Mary. Let me explain this statement further. 50. Beware, chosen soul, of thinking that it is more perfect to direct your work and intention straight to Jesus or straight to God. Without Mary, your work and your intention will be of little value. But if you go to God through Mary, your work will become Mary's work, and consequently will be most noble and most worthy of God. 55. This devotion faithfully practised produces countless happy effects in the soul. The most important of them is that it establishes, even here on earth, Mary's life in the soul, so that it is no longer the soul that lives, but Mary who lives in it. In a manner of speaking, Mary's soul becomes identified with the soul of her servant. Indeed when by an unspeakable but real grace Mary most holy becomes Queen of a soul, she works untold wonders in it. She is a great wonder-worker especially in the interior of souls. She works there in secret, unsuspected by the soul, as knowledge of it might destroy the beauty of her work. The premise for such a supreme role of Mary in the lives of Catholics is based on the RCC's teachings of Mary as the mediatrix of all graces, a teaching which is lacking in scriptural support. Without going through each of the paragraphs, I will just say that the elevation of Mary to such a level, despite the reminders of Christ's authority, is idolatrous and blasphemous. And if you think these ideas are just a fringe of Catholic teaching, be sure to check out historical statements on Mary and the current push by many Catholics to define the fifth Marian dogma. This component of Catholic faith should give Protestants pause. I'm not sure how it happened, but someone was able to bulk spam the comment section of this blog, even with the security feature enabled. I got around 75 comments between 2:25 AM- 2:35 AM to 75 different blog entries. Ah, the ingenuity of evil never ceases to amaze. If it happens again, I'm going to turn the comments off for a while. In the past, I've had a hard time with Roman Catholics on Galatians 1:6-8. I've tried to get them to admit, from their perspective, that I, as a Protestant, should be viewed as eternally condemned because I don't believe the gospel officially taught by the Roman Church. But, the answer I've repeatedly gotten is that I can only be eternally condemned if I know the Catholic Church is the true church and I still reject her. What sophistry! Check out this discussion from the Catholic Answers forums. Sorry I love Catholic Answers, but I am going to have to appeal to Karl Keating directly here. Here is the problem. This is from the current "Ask an Apologist ." Here is the quote regarding whether Jews should convert to Catholicism. I have a real problem with the word ONLY here. "This means that those non-Christians who serve God to the best of their ability according to the light that they have can achieve salvation. Only if someone knew that Jesus is Messiah and God, that he founded the Catholic Church, that all who know this are required to enter it and remain in it, and deliberately refused to do so, could that person's salvation be at risk should he not repent before death." It isn't true that ONLY if someone knew that the Catholic church was the true Church, and they refused to enter it they would be damned. NOT TRUE AT ALL!!! All are obligated, in a general sense, to enter the Catholic church. If someone doesnt know that the Catholic is the one true Church, and that ignorance is their fault(provided their ignorance doesnt reduce their sin to venial, and even then they would have to have no other mortal sins on their soul) then they would be damned even though they don't "know" that the Church is the one true Church. The answer Catholic Answers gave makes it sound like no one can be damned unless they consciously know the Church is the one true Church, and obstinately refused to enter it. "Cathoogle - Catholic Google custom search engine- The best way for good Catholics to surf the web." OK, this is an irony. You know how Sippo, Madrid, DA, et all consider me a virulent anti-Catholic? Go to the Cathgoogle search page and put my name in. When I did it, my blog was the first hit. If you put Dr. White's name in, aomin will be the first hit as well. Eric Svendsen's site was third or fourth down when his name was put in. William Webster got the first hit when his name was put in. Try Turretinfan, Frank Turk, Triablogue, or any others that have been deemed unsafe anti-catholic websites by the pseudo-powers that be..
"Catholic search engine powered by Google striving to provide an easy to use resource to anyone wanting to learn more about Catholicism and provide a safer way for good Catholics to surf the web. Cathoogle is powered by Google using "safe search" technology, it produces balanced results from all perspectives, from sites all over the internet with more weighting to given to Catholic websites and sites containing content relating to Catholics and Catholicism." I would like to publicly thank Cathgoogle for allowing my site to be on their safe search engine, and for also considering aomin, ntrmin, ChristianTruth.com, and Turretinfan a "balanced result." I've written a lot on Luther's opinion on the book of James and the canon . I've asserted that Luther appears to have held lifelong doubts about the canonicity of James. This is something beyond dispute. I have found though that those who chastise Luther on his rejection of James tend to ignore the many statements in which he questions the book because of authorship. For Luther, the book was not written by an apostle, but rather a later Christian. He repeats this often, and also notes others before him did as well. Luther detractors tend to focus on his statements asserting a contradiction between James and Paul. The most popular passage comes from his preface to the book of James. Luther states: “In the first place it is flatly against St. Paul and all the rest of Scripture in ascribing justification to works [2:24]." Protestants have had a cogent harmonizing solution between Paul and James for quite some time. The book of James describes a real true faith in Christ: a real saving faith is a living faith. If no works are found in a person, that faith is a dead faith (c.f. James 2:17). James then describes a non-saving dead faith: the faith of a demon. A demon has faith that God exists, that Christ rose from the dead- I would dare say a demon knows theology better than you or I. But is the faith of this demon a saving faith? Absolutely not. James describes a living and saving faith, as opposed to a dead faith. Luther clearly taught the concept of living vs. dead faith throughout his writings. My paper here goes into this in great depth. It may be surprising though to some that Luther was actually aware of a harmonization between James and Paul, and even at times uses it. Here the question arises: How can a person be justified without the works of the Law, or how can it be that justification does not flow from our works? For St. James writes: 'We see how that by works a man is justified, and not by faith only" (Jas. 2:24). So also St. Paul: "Faith . . . worketh by love" (Gal. 5:6); and: "The doers of the law shall be justified" (Rom. 2:13). To this we reply: As the Apostle distinguishes between the law and faith, the letter and grace, so also he distinguishes between the works resulting from these. He calls those deeds "works of the Law" that are done without faith and divine grace, merely because of the law, moved either by fear of punishment or the alluring hope of reward. But works of faith he calls those deeds which are done in the spirit of (Christian) liberty and flow from love to God. These can be done only by such as are justified by faith. Justification, however, is not in any way promoted by the works of the Law, but they rather hinder it, because they keep a person from regarding himself as unrighteous and so in need of justification. When James and Paul say that a man is justified by works, they argue against the false opinion of those who think that (for justification) a faith suffices that is without works. Paul does not say that true faith exists without its proper works, for without these there is no true faith. But what he says is that it is faith alone that justifies, regardless of works. Justification therefore does not presuppose the works of the Law, but rather a living faith, which performs its proper works, as we read in Galatians 5:6 [Commentary on Romans (Michigan: Kregel, 1976), 75]. The question is asked, “How can justification take place without the works of the Law, and how by the works of the Law can there be no justification, since James 2:26 clearly states: ‘Faith apart from works is dead’ and ‘a man is justified by works,’ using the example of Abraham and Rahab (James 2:23–25)?” And Paul himself in Gal. 5:6 speaks of “faith working through love,” and above in chapter 2:13 he says that “the doers of the Law will be justified before God.” The answer to this question is that the apostle is distinguishing between the Law and faith, or between the letter and grace, and thus also between their respective works. The works of the Law are those, he says, which take place outside of faith and grace and are done at the urging of the Law, which either forces obedience through fear or allures us through the promise of temporal blessings. But the works of faith, he says, are those which are done out of the spirit of liberty and solely for the love of God. And the latter cannot be accomplished except by those who have been justified by faith, to which justification the works of the Law add nothing, indeed, they strongly hinder it, since they do not permit a man to see himself as unrighteous and in need of justification. Here is an example. If a layman should perform all the outward functions of a priest, celebrating Mass, confirming, absolving, administering the sacraments, dedicating altars, churches, vestments, vessels, etc., it is certain that these actions in all respects would be similar to those of a true priest, in fact, they might be performed more reverently and properly than the real ones. But because he has not been consecrated and ordained and sanctified, he performs nothing at all, but is only playing church and deceiving himself and his followers. It is the same way with the righteous, good, and holy works which are performed either without or before justification. For just as this layman does not become a priest by performing all these functions, although it can happen that he could be made a priest without doing them, namely, by ordination, so also the man who is righteous by the Law is actually not made righteous by the works of the Law at all, but without them, by something else, namely, through faith in Christ, by which he is justified and, as it were, ordained, so that he is made righteous for the performance of the works of righteousness, just as this layman is ordained a priest for the performance of the functions of a priest. And it can happen that the man who is righteous by the Law does works which are more according to the letter and more spectacular than the man who is righteous by grace. But yet he is not for this reason righteous but rather may actually be more impeded by these works from coming to righteousness and to the works of grace. Another example. A monkey can imitate the actions of people, but he is not a man on that account. But if he should become a man, this doubtless would not take place by virtue of these actions, by which he has imitated a man, but by some other power, namely, God’s; but then having become a man, he would truly and rightly perform the actions of a man. Therefore, when St. James and the apostle say that a man is justified by works, they are contending against the erroneous notion of those who thought that faith suffices without works, although the apostle does not say that faith justifies without its own works (because then there would be no faith, since, according to the philosophers, “action is the evidence that form exists”﻿), but that it justifies without the works of the Law. Therefore justification does not demand the works of the Law but a living faith which produces its own works. But if faith justifies with its own works, but without the works of the Law, then why are heretics regarded as beyond justification, since they also believe and from this same faith produce great and sometimes even greater works than the other believers? And all the people in the church who are spiritually proud, who have many and great works which also surely proceed from faith, are such people also unrighteous? Does something other than faith in Christ with its good works seem to be required for justification? James answers the question briefly: “Whosoever … fails in one point has become guilty of all of it” (2:10). For faith is indivisible. Therefore it is either a whole faith and believes all that is to be believed, or it is no faith, if it does not believe one part. The Lord thus compares it to one pearl, to one grain of mustard, etc. Because “Christ is not divided” (cf. 1 Cor. 1:13), therefore He is either completely denied in one unit, or else He is completely affirmed. He cannot be at the same time denied in one word and confessed in another. But heretics are always picking out one thing or many from those which are to be believed, against which they set their minds in their arrogance, as if they were wiser than all the rest. And thus they believe nothing which is to be believed and perish without faith, without obedience toward God, while still in their great works, which are so similar to the real ones. They are not different from the Jews, who themselves believe many things which the church also truly believes. But one only does the thought of their own proud heart oppose, namely, Christ, and thus they perish in their unbelief. So also every proud man in his own mind always opposes either the precept or the counsel of him who is correctly guiding him to salvation. Since he does not believe this counsel, he likewise believes nothing, and his entire faith perishes because of the tenacity of one thought. We must always humbly, therefore, give way in our thinking, lest we stumble over this rock of offense,﻿34﻿ that is, the truth which in humility stands against us and opposes our own thinking. For since we are liars, the truth can never come to us except as an apparent adversary to what we are thinking, for we presume that we think the truth, and we wish to hear and see as truth only that which agrees with us and applauds us. But this cannot be. The works of all of these men, therefore, are the works of the Law, not of faith or of grace, indeed they are opposed to and in conflict with faith. Thus justification not only can but must take place without them, and with the apostle must “be counted as refuse for the sake of Christ” (Phil. 3:8). Now of course, one must be very careful with Luther's early works, as the last passage from his work on Romans shows. Luther was not yet at his full understanding of justification that he became famous for. The early statements though are very intriguing. Even though Luther knew how to harmonize James and Paul, it may be the case that the question of James’ apostleship out-weighed it. Further, I do recall reading of Luther's disdain for his Catholic opponents repeatedly quoting the book of James to him. This indeed provoked him, but I wonder why he didn't simply fight back with something similar to the above. While I can appreciate the desire to set good standards in apologetics, most of what we do on this board is colloquial apolgetics and quite frankly NONE of us is qualified to set any standards in defense of the faith. Only the Magisterium can do that and so far, the hierarchy has viewed the diversity of Catholic lay apologists (with some notable exceptions) with general favor. And quite frankly, this is not a court of law where strict form and method are required. Nor is the field of Catholic apologetics a narrow discipline in which one can blithely dismiss approaches other than one's own. And my comment about "diversity" among Catholic Apologists is quite CENTRAL to this controversy. The strict Thomists and the Transcendenatal Thomists have very differnet ways of defending the faith. The same is true for the Franciscans and the Jesuits. On this very board, we have a had a controversy over the title of the BVM as the "Mediatrix of All Graces" in which Pat Madrid and I strongly disagreed. Nobody can claim to speak DEFINITIVELY for Catholic orthodoxy except the Pope and the bishops in communion with him. We apologists in the trenches may have our disagreements but we are all working for the same end. We need to respect that and not go attacking each other needlessly. Sometimes one needs to speak out, but this should be done only for grave necessity. I read a lot of Catholic blogs and websites, though I haven't checked in on Gerry Matatics for quite a while. I actually went to one of Gerry's lectures on his "mega tour," probably now about two years ago. It was in a Holiday Inn (if I recall correctly). I was one of a small handful of people, probably, I'd say, maybe thirty people. It was a very small conference room, implying to me that Gerry didn't expect hundreds of people on a Saturday afternoon. When Carrie saw Gerry speak a little while later, she said, "I am not sure if the particular seminar I attended would attest to the size (or makeup) of the sedevacantist following or not, but besides Gerry, there were 5 men and myself in the room." Well, anyway, Gerry's actually revamped his website, and put more content on it. Under the category, "What's New?" is the following: "Gerry's speaking tours make converts!" So, I clicked on it, and my new computer coughed a little bit, and then opened up an Adobe document called "Winter 2005-2006 Furmanappeal+ response." The document, was actually written in 2005. So for Gerry, "What's New?" back dates four years! On that occasion - with the amphitheater filled to double its regulation capacity, and hundreds of students standing in the back, sitting in the aisles, on the floor in front, and even around my feet on the stage - these bright, serious Protestants had sat riveted to their chairs, astounded to hear a Biblical defense of Catholic teaching as well as Scriptural critiques of Protestant errors on salvation, sacraments, Mary, papacy, etc. Thinking neither I — nor any other Catholic apologist — would ever get a chance quite like that again, I told them, charitably but uncompromisingly, that if they remained Protestants they could no longer claim with a clear conscience to be Bible believing Christians, since I had shown them sufficient evidence that the Bible taught the Catholic Faith, not Protestantism. I told them that if they wanted to be truly Bible-believing Christians, they needed to become Catholics. I thanked them for the privilege of addressing them, for their hospitality and attentiveness, told them that I loved them and that I would be praying for their conversions. grace, astounded me. Despite my challenging them to rethink their most fundamental convictions, the entire audience of Protestants stood to its feet and gave me a loud, long, standing ovation. I was flabbergasted. But that was nothing compared to what followed. For though none of the students had to stay for the ensuing question and answer period, over half of them did, only peeling away by ones and twos over the next several hours. Although I had begun speaking at 7 pm and finished my talk proper at 9, the last group of students did not leave the question and answer period until 2:30 am! It was a powerful indicator of just how hungry people are for the truth when God’s grace has its way with them, and how rare they find the opportunity to get clear, convincing, Biblically-based answers to their questions about the differences between Protestantism and Catholicism. unbeknownst to me (initially, soon after our encounter: I had been a Fundamental Evangelical Southern Baptist all my life. I was as anti-Catholic as one could be before I heard Gerry Matatics at Furman. To be blunt, I thought all Catholics were going to hell and had no idea of what Christianity really was. However, while listening to Gerry from 7 p.m. until 2:30 a.m. (when we were forced out by school policy, not because of Gerry's unwillingness to listen to more of my accusations and pedantic questions), I realized that Gerry Matatics was one Catholic who knew the Bible, was a Christian, and had posed questions to me that I could not answer from my “sola scriptura, sola fide” background. He offered both a friend of mine and me ALL of his available tapes for FREE and gave us his e-mail address for any further questions we might have ... While listening to Gerry for 7½ hours I heard nothing but Biblical and historical proofs. I praise the thrice-holy Trinity for working through Gerry Matatics to lead me to the Catholic Church and I now desire to serve Christ's True Church in the Holy Priesthood. Thanks to that initial conversation and many subsequent ones,Jonathan not only joined the Catholic Church but, after graduating from Furman and studying with me for part of a summer,entered a traditional seminary in Europe so he can spend his life preaching the traditional Catholic Faith and offering the traditional Latin Mass. He was instrumental in getting me to lecture again at Furman on a subsequent trip, despite opposition from so-called “moderate” but non-traditional Catholics there, and he will be a strategic leader in the battle to restore Tradition to the contemporary Catholic scene. OK, so Gerry's says the guy became a traditional Catholic. I actually found the guy. The story on this link was published February 2002, and they state the conversion story happened "a year ago" placing it in 2001. Perhaps traditional Catholicism was more popular back in 2001! This article from Karl Keating in 1995 addresses Gerry's involvement with the movement. I'm not doubting Gerry filled the place he said he did- I just didn't think that many people cared about "traditional Catholicism ." I came across a Luther quote being used by a "word of faith" (WOF) advocate over on the CARM boards. He explained how the Reformation was supposed to distance itself from Roman Catholic asceticism but "the children of these reformers want to head back to Rome (where a lot of their Augustinian doctrine is derived anyhow)." Not to hard to read between the lines here- the children of the Reformation returned back to the Roman ideals of spirituality- things like chastity, poverty, and obedience, and the like. The main ideal in question seems to poverty. Finally, you see in this Gospel that Christ, though he held Gospel poverty in the highest esteem and was not anxious about the morrow, as he teaches in Matthew 6, 34, had still some provisions, as the two hundred shillings, the five loaves and the two fishes; in order that we may learn how such poverty and freedom from care consist not in having nothing at all, as the barefooted fanatics and monks profess, and yet they themselves do not hold to it; but it consists in a free heart and a poor spirit. For even Abraham and Isaac had great possessions, and yet they lived without worry and in poverty, like the best Christians do. The link given for the quote source didn't work, but the sermon was easy enough to locate. It's from Luther's sermon "Fourth Sunday in Lent, John 6:5-14, The Feeding of the 5000" found in volume II:166-172 of The Sermons of Martin Luther, originally published in 1906. If you've got the Baker reprint, it's in volume 1. As far as I can tell, no date for the sermon is given. The sermon is divided into two parts. The first part is more of a literal interpretation of John 6:5-14, while the second part is referred to as "The Allegorical Interpretation." I'm going to speculate the sermon was preached early in Luther's Reformation career, because later in his career Luther shied away from following the customary medieval method of giving an allegorical interpretation. Luther would state of allegorical interpretation: "...Allegory is often unsafe as a prop for the faith, it often depends upon human conjecture and opinion. If anyone leans on that, he is leaning on the reed of Egypt" (What Luther Says Vol. 1 p. 80). 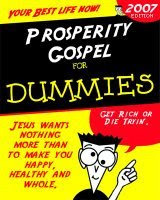 "Gospel poverty" seems to me to imply not seeking after wealth and prosperity, but rather relying on God to provide what one needs (Matthew 6:19-34). Even though Christ taught against storing up treasures on earth, he himself had exactly what he needed: "some provisions, as the two hundred shillings, the five loaves and the two fishes." The monks who pursued vows of poverty in order to be free of the world really were not free. Rather, they were trusting in their own righteousness. These are "the teachers who wish to make the people pious and to quiet them with God's laws." These are those who will never "know that the Gospel is devised and bestowed, not through our own merit, but out of pure grace." Then Luther provides an allegorical understanding of what poverty and freedom from care is: it consists in a free heart and a poor spirit. That is, these are they who believe Matthew 6:19-34. They are those who are not spiritually proud, but thirst for the word of God. The WOF apologist using this Luther sermon advocates health and wealth, and summons Luther to his aid. For Luther though, the extremes of great poverty and great wealth were dangerous. Luther believed that Christians should not forsake or throw away what they own, but rather they should not fasten their hearts to their possessions (What Luther Says Vol. I, p.438). Luther's writings caution against seeking wealth, and the great trouble wealth brings. For Luther, economic status is not a sign of God's favor or disfavor. He's correct, to be poor in spirit for Luther is not to be without possessions- but it doesn't follow that Luther advocated a prosperity gospel.